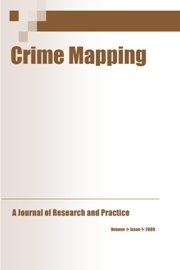 Crime Mapping: A Journal of Research and Practice is an international, peer-reviewed journal dedicated to publishing high quality manuscripts on the spatial, temporal, and geographical aspects of crime and crime analysis from both a theoretical and an applied perspective. Crime Mapping is published twice a year, in the Spring and Fall, by CJ Research. Crime Mapping: A Journal of Research and Practice aims to cover a wide range of interdisciplinary topics related to crime mapping, crime analysis and the use of geospatial methods and techniques in criminal justice. Topics include, but are not limited to: spatial theories of crime, spatial statistics for crime analysis, crime hotspot detection, operational crime mapping, spatio-temporal analysis of crime, tracking technologies, investigative crime mapping, tactical crime mapping, geographic profiling, web-based crime mapping, crime cartography, as well as general topics related to the use of geospatial technologies in criminal justice, such as Geographic Information Systems (GIS), Global Positioning Systems (GPS) and Remote Sensing (RS). Crime mapping plays an important role in almost any form of crime analysis and can improve our understanding of the important relationships between people, location, time, and crime. It therefore assists us in discovering crime patterns, implementing corrective strategies, optimizing resource allocation and developing crime prevention measures. While existing journals in criminal justice, geography and other fields publish crime mapping and analysis related articles, they are offered limited priority and recognition, and no journal is currently focused on the broader spectrum of Geographic Information Science and criminal justice. Crime Mapping: A Journal of Research and Practice is filling this gap in existing journals by providing a credible venue for researchers and practitioners to publish their crime mapping research.